When you start out to undertake a home improvement project, nobody really thinks about all the mistakes that could happen. Although, every home improvement project or fixer rehab has its ups and downs, and there are plenty of mistakes to go around. Nobody is immune. But avoiding costly mistakes involves more than memorizing catchy-but-important phrases such as "Measure Twice, Cut Once," or "Lefty-Loosey, Righty-Tighty." One crucial tip you should not ignore: You may learn from your own mistakes, but it’s better to learn from the mistakes of others. Sometimes, do-it-yourselfers (DIYers) get stung before they ever get moving on something as complex as a kitchen remodel. It happens primarily for two reasons. Because they paid too much or they bought a house in the wrong neighborhood -- slammed up against the freeway, next to railroad tracks or that lone single-family nestled in a row of commercial buildings. You can avoid both these problems by looking at comparable sales for the neighborhood before you buy and asking about the drawbacks of the location. If you don't want to live under a flight path, the chances are a new buyer won't either. Remember, the best time to think about selling a home is when you buy. Because the most beautiful remodel isn't going to pay back in spades if your property backs up to the city dump. Remember the real estate mantra: location, location, location. Many DIYers shy away from obtaining permits because they worry about the expense or think they don't need a permit. Some cities issue permits based on political reasons, and some may appear unnecessary, but get a permit anyway, because it's against the law if you refuse to comply and it's required. Selling a home that was remodeled without a permit can be difficult. Inspectors will help to ensure the job is done correctly and to code. Many buyers don't want to buy a home that has had work done without a permit. If your neighbor reports you to the city and an inspector discovers you have completed work without a permit, you might be required to tear it apart and start over. The buyer's lender's underwriter might require a permit if the appraiser notes a remodel without permits. Overly zealous DIYers often think it will take less time to complete a job than is necessary. Prepare a calendar, day-by-day, outlining each portion of your rehab and how many hours it will take to complete. This will keep you on a tight schedule and give you a realistic time frame from start to finish. For example, a tiling job cannot be completed in one day. First, the mastic is applied, tiles are cut and laid. The area needs to cure and dry at least 24 hours. After the tiles are set, you will grout. You still need to wait another day to walk on it. The adage is figure your cost and triple it. But that's not really necessary. Itemize every scrap of material in your estimates, including mundane items such as the cost of nails, staples, fiberglass tape or joint compound. They all add up. Then account for at least a 15% overage of materials for waste. Throw in another 30% for price increases, especially if you're not buying all your materials at once. If you're afraid of heights or unsteady in high places, don't install a roof. Life is short and then you die. Hire somebody else to do it. Before you tackle a job, think about the job from its inception all the way through to its completion. You don't want to reach the halfway mark and discover you can't finish. Some projects require more than one person. It's hard to hang drywall on a ceiling by yourself, even with a deadman prop. Pay attention to the weight you lift; it may wreak havoc on your back or throw you off balance. You have no idea when you tear open a wall what you will find. For example, you could find termites or beetles. A pest infestation will require eradication and / or structural repair. You may discover wiring that needs to be replaced, pipes that need to be rerouted or moisture problems that have rotted away joists or sill plates. Pad your budget and allow yourself a bit of flexibility in your work schedule to accommodate these not-so-nice surprises. You may want to obtain a pest inspection if you suspect an infestation. Always, always, always get a home inspection when you buy. And hire a qualified and accredited individual to perform the inspection -- not your Uncle Joe or your buddy contractor, get a real inspector. Be there for the inspection, at least at the end, and ask questions. Pay close attention to safety issues. Be an informed buyer. If the inspector calls for further inspection by another professional contractor, find out if the inspector is telling you there could be a serious issue or if the inspector isn't licensed to address that issue. There is a difference. When it comes to tools, you can't go wrong by buying professional tools that are made to perform specific functions. 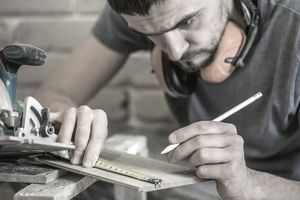 While you can get by using a drywall gun to screw deck boards to a joist, you can't use a hacksaw to make precise miter cuts with any accuracy or a 9-volt cordless drill to drive six-inch screws through a beam. Wear goggles when using a power saw. Don't stand on the top rung of a ladder. Hit the main breaker (off) when working with electricity. Don't skimp. You can buy ceramic tile for 50 cents a square foot, but it will probably crack. Buyers will notice if you install quarter-inch granite on counters or buy plastic baseboards. You want the quality of your work to shine throughout the house. If you shop carefully and negotiate prices, you can purchase brand-name merchandise for less. Then you can advertise those manufacturer names in your marketing materials, and buyers will never know how much you paid. Better yet, they won't be calling you after escrow closes to complain that your new dishwasher just dumped water all over the floor. DIYers like to use a rule of thumb that says they can sell a house for two to three times more than the cost of its improvements, plus its acquisition price. That formula doesn't work all the time. It's far wiser to check the comparable sales for similar homes in the neighborhood to determine if your improvements are in line with other homes in that area. You don't want to over-improve. Plan for the bottom of those comparable sales as a return on your investment. Anything you make above that figure is gravy. Don't be afraid to ask your Realtor for help. Experienced Realtors are a great untapped source of information. A good agent can help you to make improvements buyers will want and not spend money on items that might be important to you but a waste for resale value.